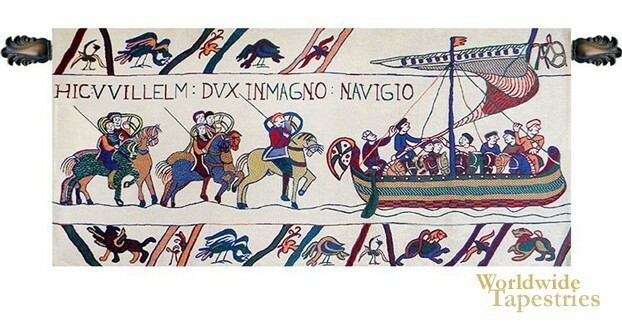 In this Bayeux William Navagio tapestry, we see a scene from the Battle of Hastings in 1066. Here we see the voyage of Duke William and his men to land on the shores of England in the summer. The men are seen with their shields, and also behind, are the men on horseback. A variety of real and mythical animals are also seen in the decorative border. This Bayeux Navagio tapestry is backed with lining and tunnel for easy hanging. Note: tapestry rod and tassels, where pictured, are purchased separately. Dimensions: W 69" x H 31"